VW finally considers entering the US truck market. We have been clamoring for Volkswagen to model for the US market. Our prayers may have been answered, because the have turned out to be true. At the 2018 New York Auto Show, VW has revealed the Atlas Tanoak pickup truck concept. Named after a species of tree native to the US Pacific Coast, the Atlas Tanoak is the first truck to be based on the company's MQB modular transverse matrix architecture. Although it is just a concept model (for now), the Atlas Tanoak is powered by a 3.6-liter 276 horsepower V6 mated to an eight-speed automatic sending power to all four wheels. Volkswagen claims it has no immediate plans to put it into production, but the company is willing to listen to the reactions of buyers and the media. We think this could make an interesting competitor to the Honda Ridgeline, so we'd love to see it reach production. Compared to the three-row Atlas crossover, the Tanoak is 15.8 inches longer, for a total of 214.1 inches putting it in the large-midsize pickup segment by US standards. The concept has also been raised two inches compared to the Atlas, yielding 9.8 inches of ground clearance. 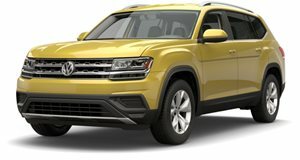 Volkswagen designed the Tanoak as a dual-cab, five-seater with a bed that is 64.1 inches long, 57.1 inches wide (50.4 inches between the wheel wells), and 20.9 inches high. According to VW, the bed is perfectly suited to carry bikes or surfboards with the tailgate in place, or ATVs and dirt bikes with the tailgate down. VW hasn't just focused on making the Tanoak practical, but the company has put some serious effort into making the truck go off-road. Drivers can select from off-road modes to maximize grip on dry, wet, slick, or unpaved surfaces. For even tougher off-road duty, the Tanoak has a mode that provides a low-range gear reduction. Building this truck took a lot more effort than chopping the back off an Atlas. The front end is more aggressive with new headlights, grille, hood and a front bumper, which were redesigned to extend into the side profile. Underneath, the Tanoak features rugged underbody protection which integrates a centrally mounted winch and carabiner. Other unique touches include an Atlas logo that is integrated into the tailgate, which also features distinctive wrap-around, animated lighting with red LED strips on the upper and lower areas. The VW logo is illuminated in white, and there is a white LED stripe in the cargo bed rail. Above each exhaust tailpipe sits a rugged tow hook for maximum towing capability. For the interior, Volkswagen has just given us a rehash of the Atlas' general layout. Sporty, contoured seats are used up front, offering lateral support during tough off-road use. Since this is a concept, the second row passengers receive individual seats to match the ergonomic and design quality of the front. Even the instruments, center console, and multi-function steering wheel are heavily redesigned components taken from the Atlas. Most of the major functions, including the air conditioning, are operated digitally rather than with physical buttons and knobs. Volkswagen's digital cockpit makes an appearance and combines infotainment and climate control screens. As a nice final touch, the interior glows in yellow or blue light at night, depending on whether the vehicle is in Off-road or City mode. We assume a potential production version would be toned down greatly compared to this concept, but we are just hoping Volkswagen finally gives us the German pickup truck we've been lusting after for years.